Last Month I took part in the jury for the Scholastic Art Awards. I felt honored to sit on the 3D jury, mostly because I had received three gold key awards when I was in high school over 30 years ago. This year was the first year that the artwork was chosen from all digital images ...quite hard for 3D, since you can't get the best view of the pieces. On the jury for last years awards, we made our selections from the actual art work. To see the pieces them self, you can get a better idea of technique, scale, and details. Digital/slide images are subject to the additional hurtle of the photographers skill...or lack of. I won't be showing you any of my early slide photos...! (it took me several years and dozens of rolls) and learning that the right pro can do a better job than I.
I started thinking about my home town high school art class, and wondered what's happen there. It looks like the next generation has taken over, and all is well with a new art teacher getting her students involved in community art projects...score one for the A-TEAM. 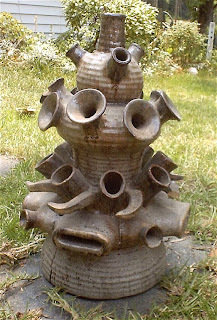 Here is a photo of one of the pieces that I received a Scholastic Art Awards Gold Key for, in 1977...! 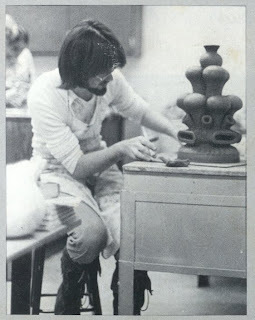 On exhibit in the permanent collection of...MAMA...(not to be confused with MOMA)...to the left is a photo of me...working on another piece that same year. We're planning a trip to Seagrove in March...maybe I'll go back to see what the old home town classroom looks like these days... IF...they let me through the door...! i think it's great that you are now supporting a project that i am sure influenced you greatly when you were a high school student... it's all about giving back, isn't it?